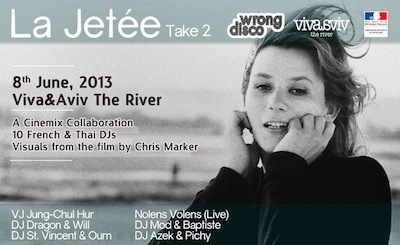 Chris Marker's short film La Jetee will be screened at Viva & Aviv, a cafe at the River City mall, on 8th June, with a new soundtrack performed live by Bangkok DJs Wrong Disco. La Jetee, comprised almost entirely of still images, was described by its director as a "photo-roman". It remains one of the most original works of avant-garde cinema, and was the inspiration for Terry Gilliam's film Twelve Monkeys.